Monday was our last day in Belize. Our flight wasn't until 4:40pm though, so we had a whole day for one more adventure. 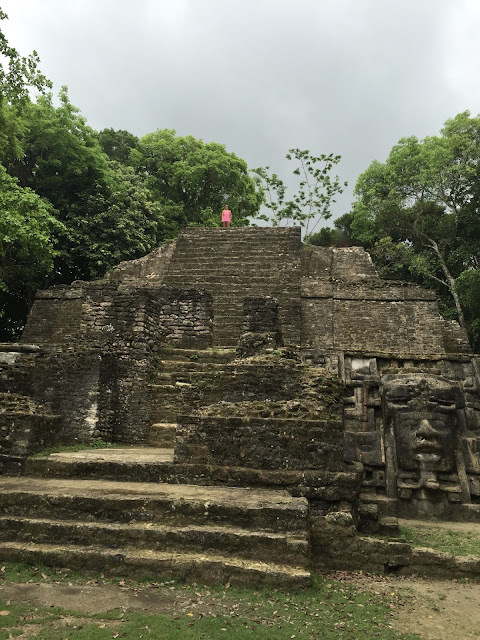 And since Belize was once the epicenter of the ancient Mayan world, we couldn't head home without touring at least one of the ruins sites. We started the day early by catching the 7am water taxi back to the mainland and met our tour guide Javier with Lamanai Belize Tours at the water taxi terminal. for an Indiana Jones style ride down the New River! We were hoping to see some spider monkeys & crocodiles along the 'Snake Alley' part of the river but the weather wasn't ideal for them to come out. We also saw the large Mennonite community that lives along the river. we finally reached the ancient city of Lamanai! Lamanai is one of the Mayan largest sites in Belize & the structures are scattered around the site. To get from one structure to the next, you have to take a trek through the Belizean jungle! Which has identical 13 foot masks of a Mayan king on each side. which is the tallest structure in Lamanai. From the top, you can see all the way to Mexico! That pink dot at the top is me! Turn your volume up to hear the jungle sounds! where the Mayans played a ball game called pitz. which is named after the jaguar faces carved on the bottom of each side. and had a traditional Belizean lunch of stewed chicken, rice & beans & candied plantains prepared by our tour guide's mom. We weren't expecting much after the rest of our food experiences but it was one of the best meals we had our whole trip! And this tour was definitely one of the highlights of our vacation! Our guide told us lots of cool information about each structure, about the Mayans & about all the plants & trees we passed along the way. Some of the trees were used for spices, some for medications & even one of the trees was used to make Chiclets gum! And he timed it just right... We were the second boat to arrive & we didn't see any other tourists until we got to the last temple. So it was pretty much like a private tour of the place! After lunch, we headed back to the boat & then the van & then Javier dropped us off at the airport for our flight back home. We didn't end up having the white sand Caribbean beach vacation that I had originally thought that I was planning, but what we did have was SO MUCH BETTER! The water. The air. The beach. The snorkeling. The ocean life. The wind. The ruins. The jungle. The GO SLOW motto & the simple way of life. All made for the perfect vacation!